A new watchdog, the NHS Counter Fraud Agency, came into force on Wednesday to tackle fraud in the NHS. An estimated £1.25 billion was lost from the NHS in 2015/16 to fraud, bribery and corruption, according to new research. Criminals range from NHS patients and staff to contractors and organised criminals, said the watchdog. LONDON — The UK Department of Health set up a watchdog to crack down on the billions of pounds lost to fraud from the health service every year. 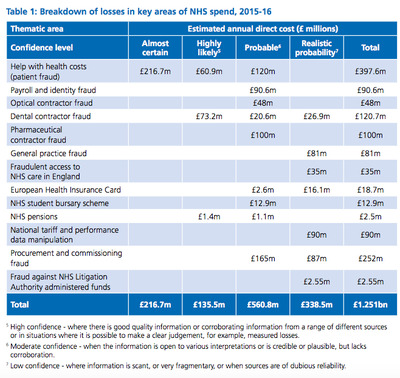 Analysis by the newly formed NHS Counter Fraud Agency (NHSCFA) estimated fraud cost the NHS £1.25 billion in 2015/16, just over 1% of the English NHS budget. The special health authority is charged with tackling a range of economic crimes “attacking the NHS,” including fraud, bribery and corruption. “As a new, independent, intelligence-led special health authority, we are dedicated to tackling fraud against the health service in England,” said Sue Frith, interim CEO of NHSCFA. “Our creation is good news for the taxpayer, for patients and for the honest majority working in and with the health service,” she said. Prescription fraud alone is estimated to have cost the NHS £217 million last year, while dental contractor fraud is estimated to have cost £121 million. Since information about economic crime is often fragmented, the true cost of fraud could be higher. The £1.25 billion estimated to have been lost last year would be enough to pay for over 40,000 staff nurses or to buy over 5,000 frontline ambulances, the analysis said. 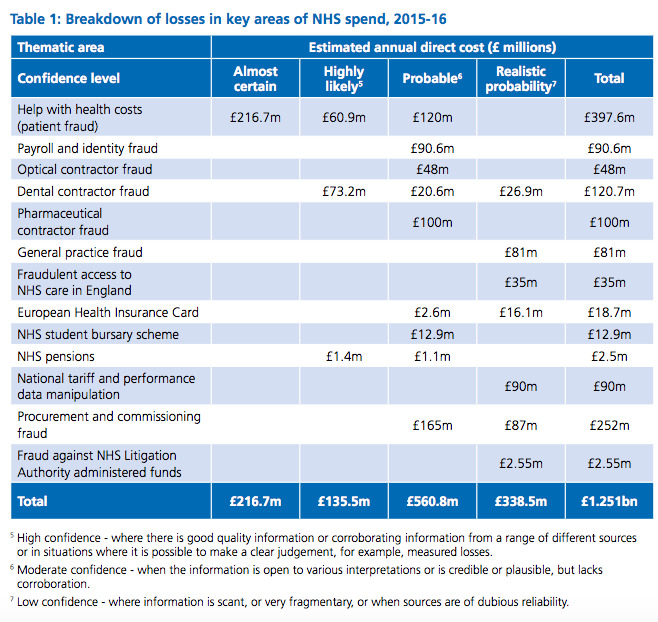 “Some of the challenges faced in this work include a limited awareness of fraud amongst NHS staff and significant under-reporting of fraud,” said Simon Hughes, interim chair of NHSCHA. “Many people find it unthinkable that anyone would seek to defraud money meant for healthcare. Our ability to counter fraud has a direct impact on health care,” he said. In June, ten people who conned the NHS, councils and the Guernsey government out of more than £12 million were sentenced to up to ten years in prison. Last year, a temporary NHS Senior Commissioner who defrauded the health service of nearly £145,000 was jailed for two years and three months.